Kevin Garcia-Lopez is one of only 4 Lights FC members to have played every minute of each of the team's first 5 regular games in 2019. Thomas Olsen, Gabe Robinson and Javan Torre are the other 3. Las Vegas, NV – Lights FC will be looking to maintain their undefeated record at home as they will take on Tacoma Defiance at Cashman Field on Saturday, April 13 with kick off scheduled for 7:30 p.m. This match will mark the debut of Lights FC's Spring Break Foam Party, which will be open to anybody in attendance. Shortly after the match begins, enormous amounts of foam will fill the Pitch Side Party area located in the old left field foul territory, where fans will be able to have one of the best views at the stadium without any additional charge than the game ticket they already have. This Saturday, Lights FC will show support on the pitch for the city's NHL hockey team, the Vegas Golden Knights, by joining the #NoTeal movement during VGK's first round series in the Stanley Cup Playoffs against the San Jose Sharks. The team will make a change to their uniforms by blocking the teal-like blue on the jerseys with gold metallic sharpies to cover it up. Las Vegas remains the USL Championship team with the most shots taken through the first five weeks of the season with a total of 83 shots; out-shooting each of their opponents so far in 2019. "What has happened for us is that we’ve created more opportunities than any other team in the league, but for whatever reason we’re not finding the back of the net," said Lights FC manager Eric Wynalda. "We’re pushing through those insecurities as a group. As a former forward, I understand how that can weigh on your confidence. The chances are still coming, but for us, it’ll come down to breaking that ice, scoring a couple of goals, getting ahead in the game. Soon we’ll stop chasing the game and we’ll get to see the true quality of our team." Out of 36 teams in the league, Lights FC is one of four who haven't allowed a goal at home this season. 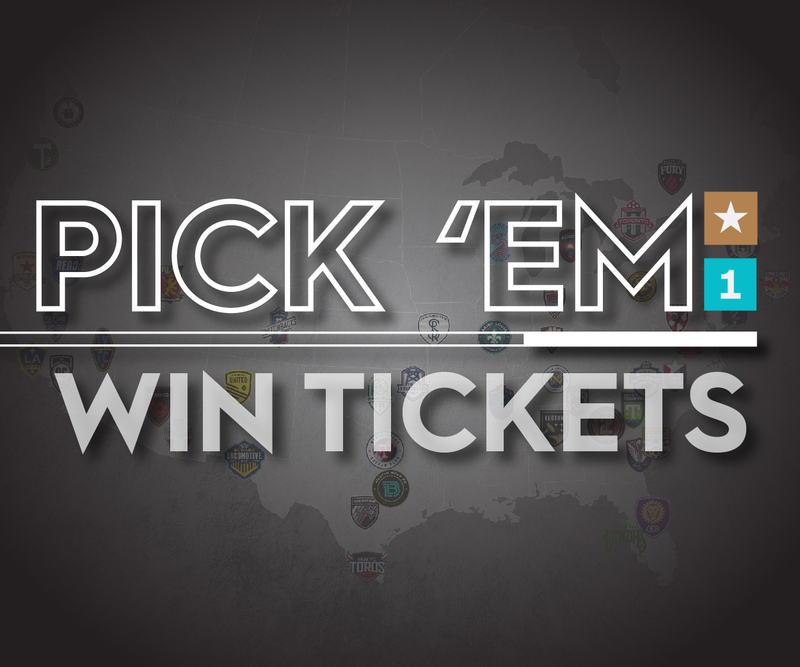 Tampa Bay (3 games) and Las Vegas (2 games) are the only USL Championship franchises with multiple matches played at their stadium and who haven't been scored on at home in 2019 (Indy Eleven and Austin Bold FC have shut out their opponents in their lone match played at home through 5 weeks). Lights FC goalkeeper Thomas Olsen has an active streak of 227 minutes without conceding a goal at Cashman Field. "Honestly, I didn't know about it until I saw it on social media," stated Olsen. "For me it's always one game at a time. Actually, one half at a time. You take one half, play that half to the best of your ability and then go to the next half and keep it going. So I honestly don't think about the scoreless streak". Forward Irvin Parra will have the opportunity to face the team he formerly played for in 2016 and 2017, Seattle Sounders 2 (franchise was rebranded to Tacoma Defiance in late January). "It'll be an exciting game because I know a lot of the guys,'' said Parra. "Because they were young players, I was like a leader for them. I'll be very happy to see some familiar faces on Saturday". Tacoma Defiance, formerly known as Seattle Sounders 2, will be playing their second match in a 4-day span on Saturday night. After playing 4 of their first 5 regular season matches at home, this will be Tacoma's second of 5 consecutive games on the road. Defiance is still win-less away from their stomping grounds as they've been defeated at Tulsa by the Roughnecks FC 4-0 and afterwards by the same score in Irvine against Orange County SC. Chris Little is in his first year as head coach with Tacoma Defiance, while still being the Director of Coaching for MLS' side Sounders FC's Academy. At the young age of 20, Hawaiian born winger Shandon Hopeau is Tacoma's captain. Defiance has USL Loan Agreements with twelve players from MLS side Seattle Sounders, including Will Bruin who scored what ended up being the game-winning goal for Tacoma over Sacramento Republic. Las Vegas native Danny Leyva, 15 year-old midfielder, signed a Homegrown Talent contract on Tuesday with MLS side Seattle Sounders, becoming the youngest signing in club history and 15th youngest in MLS history. Leyva has been a starter for Tacoma in 4 of their first 6 games this season. On September 29, 2018 he became the youngest player in team history to start a USL match, and the second-youngest in league history to earn a start. 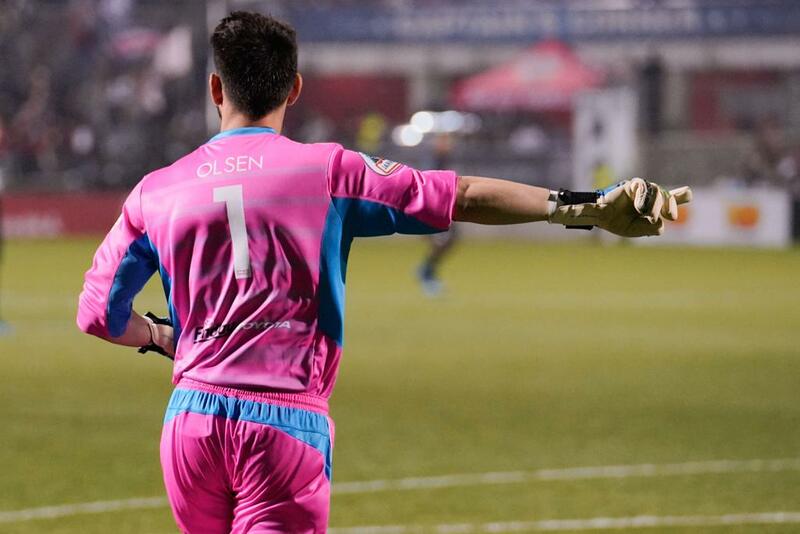 By shutting out Austin FC and Real Monarchs SLC, Thomas Olsen matched the number of clean sheets Lights FC had at home during the team's inaugural 2018 season. Parra scored his first regular season goal as part of Lights FC's roster with a penalty kick knocked in during the team's road match against San Antonio FC that ended with a 2-1 defeat. With his 3 shots against their Texas opponent, Irvin now leads the league with a total of 17 shots this season. In 2017 Parra became the first player in USL Championship history to finish a season with a "double-double", as he scored 11 goals and recorded 10 assists when he split time between Seattle Sounders 2 and Orange County SC. On Saturday he'll face his former squad, as Sounders 2 changed their name to Tacoma Defiance beginning this season. Parra played in 26 matches for Seattle's USL affiliate, scoring a total of 7 goals. Las Vegas native Thomas Olsen has an active streak of 227 minutes without allowing a goal at Cashman Field (going back to Lights FC's home finale in 2018 against Phoenix Rising FC). Olsen has shutout both opponents Las Vegas has hosted in the 2019 USL Championship season (Austin Bold FC & Real Monarchs SLC), matching in the team's first 2 home matches of the year the number of clean sheets that Lights FC had at Cashman Field during its inaugural 2018 campaign. The Valencia, California native was named to USL Championship's Team of the Week for his performance in Week 4 against Real Monarchs SLC, where he recorded 10 clearances and went 7 of 7 in duels. 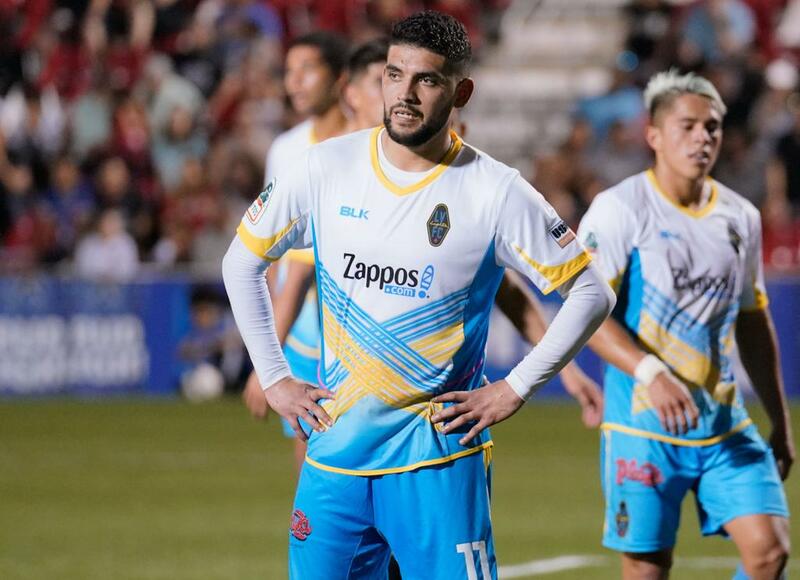 In his first month as a professional soccer player, Gabe already scored his first goal, has helped his team to a pair of clean sheets and became the first Las Vegas Lights FC player in the 2019 season to be honored as part of the league's Team of the Week. Las Vegas has been able to take advantage of their set piece opportunities, scoring goals off of them in each of their last 4 games, 2 off of corner kicks, one from a free kick and one from a penalty kick. Despite the 4 goals Lights FC has scored so far being from set pieces, they've all been assisted or scored by different players. Assists: Pablo Cruz, Cristhian Hernandez and Irvin Parra. Scored: Javan Torre, Gabe Robinson, AlexNyarko Harlley and Irvin Parra. Lights FC mutually agreed to part ways with defender Miguel Palafox and forward Bin Adolf Enow. 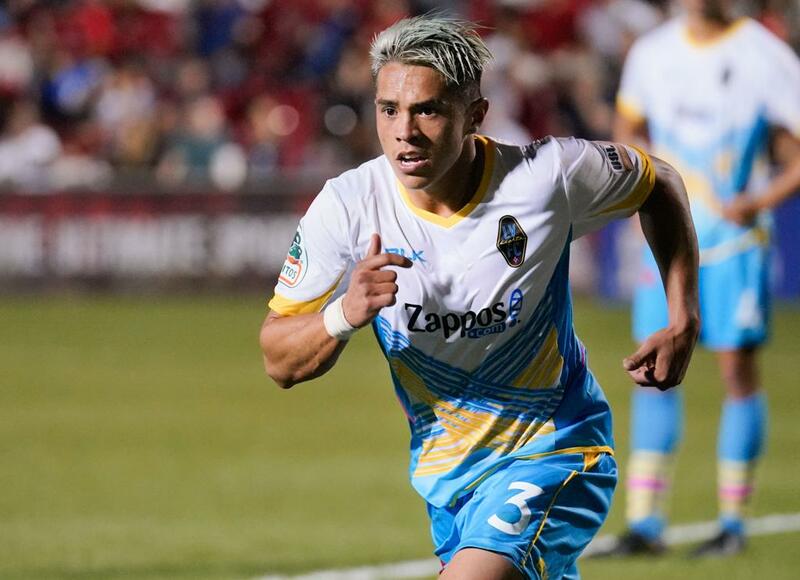 Palafox started 2 games for Las Vegas, racking up 145 minutes of play. While Enow was part of the team's gameday roster once, but didn't make his regular season debut. Irvin Parra leads USL Championship with a total of 17 shots taken in the 2019 season. Saturday’s match kicks off at 7:30 p.m., new start time for Lights FC regular season matches in 2019. For on-site ticket purchase at Cashman Field, both the box office and will call open at 2:00 p.m. on gameday. Tickets are available at LightsFC.com/Tix and at every La Bonita Supermarket in Las Vegas. Saturday's Zappos Tailgate Party, beginning at 5:30 p.m. in the Cashman Field plaza, will feature beer specials, tailgate games for adults and kids, music, the Zappos llamas Dottie and Dollie, Lights FC merchandise, and much more. The party doesn't stop at the end of the action on the pitch. After every Lights FC home match, Two Roots Brewing and Zappos will host the "Happier Hour" post-game party at Cashman Field's Club Level Restaurant. Team players and manager Eric Wynalda will make an appearance at the party that is open to fans of all ages that are in attendance at Cashman Field. Las Vegas Lights FC fans will be able to follow along every match of the 2019 USL Championship season via national & local media outlets. Saturday's game (7:30 p.m. kickoff) will be aired locally on MyLVTV with broadcasters Jeff Radcliffe and former U.S. Women's National Team player Lori Lindsey announcing the action.